The Veterans Memorial at Queensborough Community College is a small, open-air, concrete plaza in the shape of the Pentagon representing the five armed forces of the United States: Army, Navy, Marine Corps, Air Force and Coast Guard. 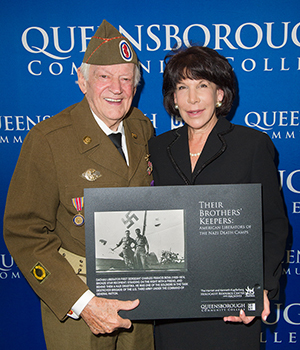 In 2013, Dr. Diane Bova Call, President of Queensborough Community College, named the Veteran’s Memorial in honor of her father, Charles F. Bova, Sr., who received a Bronze Star during World War II as a First Sergeant in the United States Third Army, First Tank Destroyer Brigade. Sergeant Bova was among the U.S. Army troops who liberated the Dachau Concentration Camp. Dr. Call’s gift is restricted to the Kupferberg Holocaust Resource Center and Archives/National Endowment for the Humanities (KHRCA/NEH) endowment fund. The mission of the Kupferberg Holocaust Resource Center and Archives is to educate current and future generations about the ramifications of unbridled prejudice, racism, and stereotyping. The KHRCA/NEH endowment fund is used to support exhibits and programs on global human rights issues. "Every person has some talents, so they should guide him or her to find their own talents and continue." Dr. Shailaja Nagarkatte talks about mentoring a student in her class, inspiring him to pursue his dream and complete his Ph.D.